I’m updating and reposting this earlier blog post as a part of Geneabloggers prompt Mystery Monday. My great grandfather, John Adams, was one of nine children born to George Adams and Catherine nee Barry listed below. John married Mary Agnes Morgan on the 7th of November 1887 at Essendon, Victoria. John’s brother, David Adams, was a witness at their marriage. Mary born 1860 North Melbourne. Died 1878 Richmond, Victoria. Catherine (Katie) born 1864 Melbourne. Married John McFadyen. 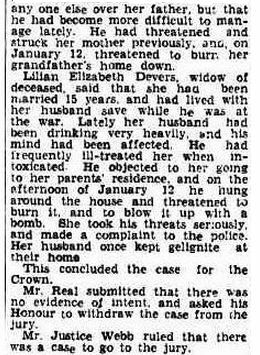 Died 1946 Victoria. David born 1866 Hotham (North Melbourne) was still alive at his father’s death in 1921. Annie born 1870 Albany, WA. Married Henry Sloan. Died 1960 Ascot Vale, Victoria. David is the only one we don’t know anything more about. We have searched multiple combinations and variations of possible marriages and deaths to no avail. The only clues we have found on him so far are mentions in family Wills that at least tell us he was still alive but not where he was living. He was a beneficiary in the Will of his father, George Adams in 1921 and also in the Will of his sister, Margaret Mansfield in 1926. After that ZILCH but I recently had a phone conversation with, Mrs Fisher, a newly found niece of David Adams – read that story here. She mentioned a vague memory of her younger years (she is currently 91) of meeting an Uncle of hers who she visited at his tiny jewellers shop in Bourke Street, Melbourne. 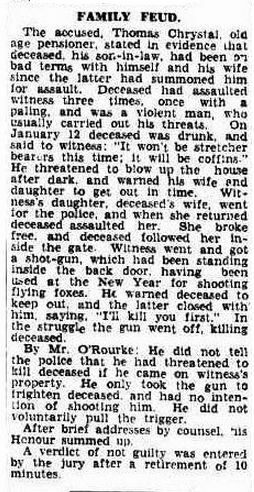 She thought this was in her teenage years, so around 1940, and was fairly certain this Uncle’s name was Joe Adams. She said from memory he was a very nice gentleman but unfortunately can’t remember much more. Her mother was another who never spoke much at all about her family. After researching as much as possible, all the other Uncles in her family, we just can’t find anyone named Joe who was a jeweller or similar. Could this Joe be David? 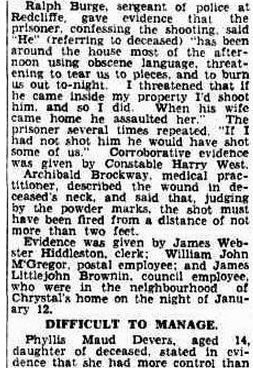 Christine, my sleuthing partner and fellow Adams descendant, found a possible David Adams in some interesting old newspaper articles. In 1886 David would have been a young man of 20. A young David Adams, along with some mates, got into a bit of bother with Police when they became mixed up with a rather dubious couple. Could this be him? As the article states, David was from a “respectable working class” family. ALLEGED OUTRAGE AT ROYAL PARK. A SERIOUS CHARGE AGAINST FIVE YOUNG MEN. 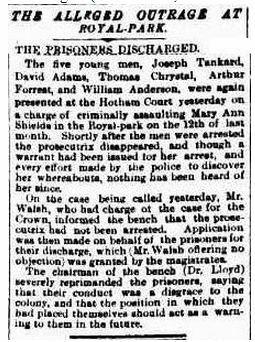 The Hotham police on Friday and Saturday arrested five young men well known in the town, one of them being Joseph Tankard, a prominent member of the Hotham Football Club, on a charge of having criminally assaulted a woman named Mary Ann Shields At about 1 o’clock on Friday morning Constable Kenny, who was on duty at the Royal park had his attention attracted to a number of men who were close together at some distance from the road. On proceeding close to the spot, the constable noticed that there was a woman with them, and he went for assistance, returning shortly afterwards with Constable Glynn. 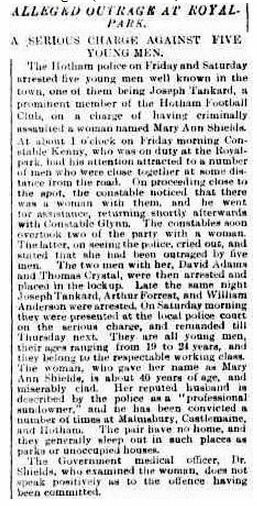 The constables soon overtook two of the party with a woman. The latter, on seeing the police, cried out, and stated that she had been outraged by five men. The two men with her, David Adams and Thomas Crystal, were then arrested and placed in the lockup. Late the same night Joseph Tankard, Arthur Forrest, and William Anderson were arrested. On Saturday morning they were presented at the local police court on the serious charge, and remanded till Thursday next. They are all young men, their ages ranging from 19 to 24 years, and they belong to the respectable working class. The woman, who gave her name as Mary Ann Shields, is about 40 years of age, and miserably clad. Her reputed husband is described by the police as a “professional sundowner,” and he has been convicted a number of times at Malmsbury, Castlemaine, and Hotham. The pair have no home, and they generally sleep out in such places as parks or unoccupied houses. The Government medical officer, Dr Shields, who examined the woman, does not speak positively as to the offence having been committed . I can’t with any certainty find David after the 1886 Royal Park adventure but on further hopeful searching for any information on the other young men it appears that Thomas Chrystal moved to Queensland. Interestingly, many years later in 1929, Thomas again came before the courts and was again discharged. This time it was rather a sad tale though.